Sports psychologist Tadhg MacIntyre reflects on what these Games meant for Ireland. 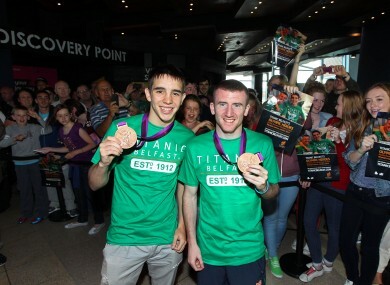 Bronze medallists Michael Conlan and Paddy Barnes yesterday. What is the impact of Katie Taylor’s performance at London 2012? She displayed resilience in her response to the pressure as she gave us Ireland’s Cathy Freeman moment. No alchemy was required for this supremely talented athlete to become Olympic Champion. The female equivalent of Brian O’Driscoll (but she can play soccer too), her ambition as an 11-year-old was realised through a committed father-coach partnership and over a decade’s training. For Katie, another title and lasting memories; for the public, a sense of pride, emotional release, partial amnesia but don’t expect Ireland to have a production line of world beaters in Women’s boxing – there is only one Katie Taylor. Our heroine Katie again folks. Her legacy was in legitimising the sport of Women’s boxing. Her skill, composure and dominance of lightweight boxing gave kudos to the sport which was less than a decade old. In 2009 the International Olympic Committee gave the green light for its inclusion in the programme in London. Yet the gender question in sport is more amber than green. Both Saudi Arabia and Qatar included women participants in their teams for the first time. If this battle is to be won then the IOC should only accept teams that comprise equal numbers of males and females. Women have earned more bling in London 2012 for Team GB than their male counterparts and among Ireland’s best results were sailor Annalise Murphy (4th), canoeist Hannah Craig (9th) and modern pentathlete Natalia Coyle (9th). Paddy Barnes, the first Irish boxer to win consecutive bronze medals at an Olympic games, is an example to all of us. What the Belfast born boxer has clearly demonstrated is the benefit of training or what is termed deliberate practice. Malcolm Gladwell popularised the 10-year rule or the 10,000 hours principle which arose from the research on expertise by Anders Ericsson. Four years ago, Paddy was outboxed in an Olympic semi-final by China’s Shiming Zou score 15-0. Almost 1,500 days later, accumulating thousands of hours of training, sparring and conditioning, the score against the same opponent was 15-15 and only went to the Chinese fighter on countback. Dedication, top class coaching and support structures and deliberate practice are the key to sporting success. The Summer Olympic Games have 28 sports but the art of boomerang throwing could easily be added to the list. When opportunies arise we seldom pause to reflect on the potential consequences and plan for every eventuality. Take the Irish Women’s 4 x 400m relay team that qualified a place for London 2012. Athletics Ireland set the cut-off date for final selection prior to the National Championships. An unwieldy process of selection, de-selection and re-selection ensued which undoubtedly didn’t make the team run any faster. The plan for selection appears to have been influenced by confirmation bias, the tendency to search for or interpret information in a way that confirms one’s preconceptions. Inaccurate assumptions in decision making can come right back and hit you. Selectors should ensure this stressful but predictable issue of selection does not add an extra burden onto the athletes. Many of our young athletes dream of competing in the greatest sporting show on earth but only a few get to realise this ambition. In 2012, we were represented by 66 athletes in 16 sports. If we are to prioritise Olympic competition in the future we need to make some hard choices and that’s not just whether we should select on the basis of A or B standards. Our achievements in boxing have to be viewed in the light of the fact that this has traditionally been our gilt edged sporting endevour coupled with significant investment over the past decade, Ireland ranks 5th on the medal table for boxing in 2012. Boxing requires attitude, world class coaching and support but doesn’t require the infrastructure of rowing, canoe-slalom or track cycling, sports where Team GB has excelled. Do we expand our investment into sports where we have a podium tradition? For Rio 2016 we could prioritise golf, show jumping, sailing and rugby (sevens) in addition to boxing and sports where we had finalists in London. Beyond the which sport to bet on question, what of the debate over whether we should include athletes who reach B standards for Olympic selection? Olympic athletes perform much better in their second games so we should, if we wish to nurture our talent, have a more liberal policy in selection. It is worth noting that John Treacy, Olympic silver medallist from the 1984 Olympics, never ran a marathon before that event and would not be eligible to compete under the current selection regime. Record television viewing figures for the Olympic Games bring home the harsh reality that watching sport doesn’t equate with getting people actively involved in sport. Indeed, viewers may have become more sedentary as they consumed a diet of sporting theatre from their couch. One colleague of mine suggested that viewers do 10 press-ups every time they heard the words “unbelieveable”, “surreal” or “incredible” uttered by commentators to beat the Homer Simpson-like existance during the 16 days of the Games. So who is inspired by London 2012? The 70,000 volunteers at the Games are the big winners in psychological terms here. Called the Gamesmakers, by contributing to the event they gained self-esteem through their acts of kindness and social cohesion. The volunteers will certainly be inspired and maybe key to generation 2020. An example comes from a European Championship event in canoe sport held in Ireland almost a decade ago. Four volunteers who were photographed assisting in the medal ceremony went on to represent Ireland within 5 years. We hope that the Irish Olympians of 2012, if not commiting for another quadrennial cycle, mentor or coach generation 2020. And finally, the consumers of London 2012 should choose an Olympic sport to try out with a friend. Only 1,453 days to the 31st Olympiad in Rio, 2016. Email “Opinion: 6 steps to understanding the impact of London 2012 ”. Feedback on “Opinion: 6 steps to understanding the impact of London 2012 ”.